Gorgonzola is an Italian blue cheese, but any blue cheese works well. Combine Gorgonzola and 1 Tbsp. butter in a small bowl; set aside. Spread remaining butter on one side of each bread slice. 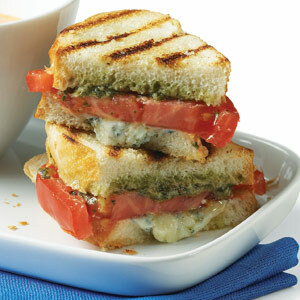 Spread Gorgonzola mixture on unbuttered sides of four slices of bread and top with one tomato slice. Spread pesto on remaining four slices of bread and arrange over tomato-topped bread, buttered side up. Heat a grill pan or large nonstick skillet over medium heat for 2 minutes. Grill sandwiches until golden on bottom and cheese is heated through, 2–3 minutes. Flip sandwiches, flatten with a spatula, and toast 1–2 minutes longer. Let sandwiches stand for 2 minutes off heat before serving. Spread the blue cheese butter generously over four slices of bread, then top with a tomato slice. Top the tomato with a pesto-covered slice of bread, then grill sandwiches until toasted.